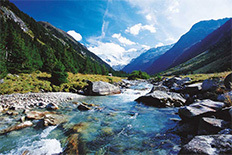 Soča River is located in the west of Slovenia and next to it is our fishing lodge in Slovenia. 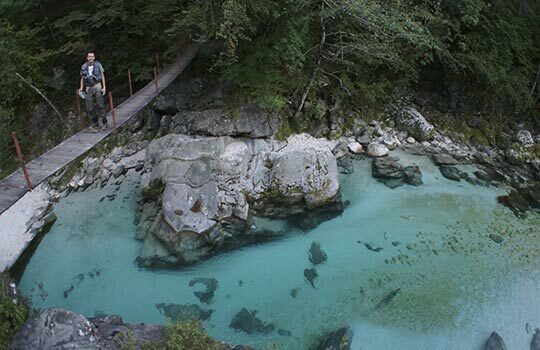 This river, characterized by the turquoise color of its waters, it has 138 kilometers long and it is born in the Trenta Valley, in the Julian Alps. The river runs alongside cities such as Bovec, Kobarid or Tolmin. In the Valley of the Soča River is centered the story of the novel “Farewell to Arms” written by the Novel Prize Ernest Hemingway. It is also worth noting that it has been the scene to record well-known films like Chronicles of Narnia: Prince Caspian by Disney. 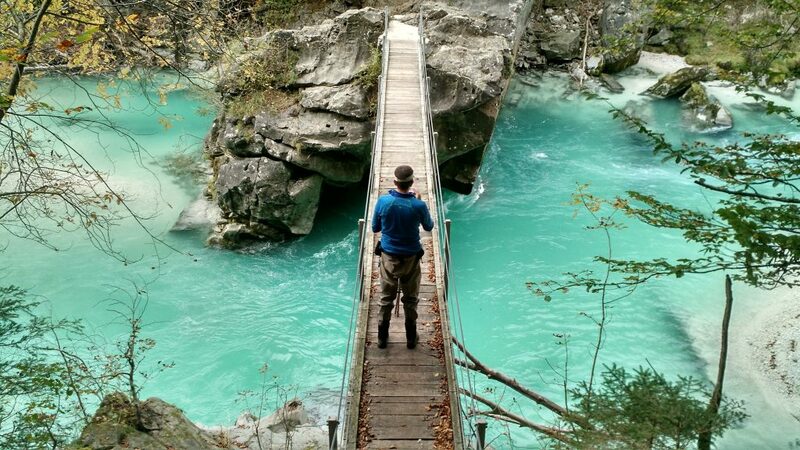 But, if the Soca River is knowed in the world for some reason, it is because is considered to be the most spectacular river in the world for the practice of fly fishing. Can you imagine fishing large trout with a dry fly in an emerald blue river? – The higher part is managed for Fisheries Reseach Institute of Slovenia. 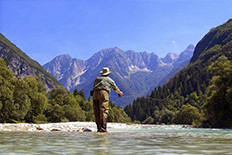 – The lower part is managed for Angling Club of Tolmin. The fishing season is the same one in both sections. Starts 1 of april and finalize 31 of October. 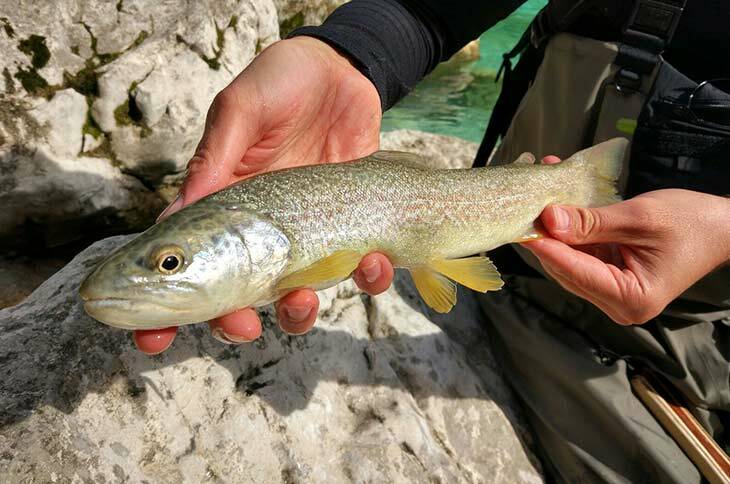 Among anglers it is world-renowned that in the Soča river basin inhabits a unique species of trout Salmo marmoratus (known as marble trout). This species was in danger due to the introduction of other species of non-native trout at some point between the First World War and the Second World War but now thanks to the enhancement of tourist fishing and the excellent work of fishing local clubs, now populations are in very good condition. 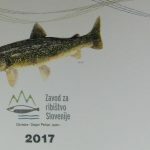 The bests months for fishing in Soča river are april, august, september and october, for fishing the tributaries may, june and july are excellent months. 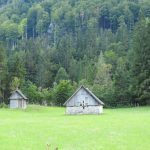 If you want to enjoy a fishing holidays in the valley of Soča river and other rivers of Slovenia you can contact through our mail and found information HERE.